This Case Study is a first-principles approach for accurate predictions of landmine loads on armored vehicles. Regardless of the modeling strategy used, the accuracy of landmine load predictions is strongly driven by the fidelity of the soil material model. Since most benchmark landmine tests have been performed on sandy soils of varying moisture contents, ranging from dry to fully saturated, PEC developed a generalized approach to modeling sandy soil for landmine simulations. The PEC sand model is based on a nonlinear three-spring approach that is used to develop a rate-independent compaction model; see Figure 1. 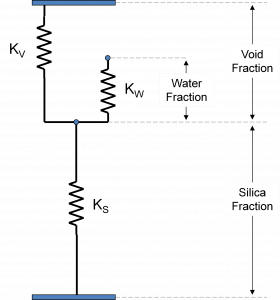 The first non-linear spring represents the pressure versus volumetric strain of the soil, up to the terminal lockup point. The second spring represents the terminal lockup, which is effectively the bulk modulus of quartz. The third non-linear spring represents the water as defined by a nonlinear Gruneisen equation of state. Using the three-spring relationship and basic material test data (static strength, compaction, moisture content and unloading modulus), the compaction curve for any sand is defined by calculating the net spring resistance across the full range of compression strains. 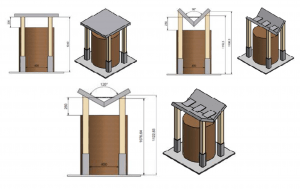 This model requires only two inputs from the user: dry sand density and moisture content. 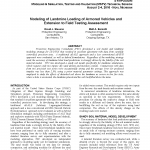 This modeling approach for sandy soil in landmine scenarios was applied to partially saturated sand tests performed by the Ernst Mach Institute1 (EMI; see Figure 2) and to fully saturated sand tests performed at the Vertical Impulse Measurement Facility2 (VIMF). An animation of the ALE implementation of the PEC soil model is shown below. For more information on landmine load predictions and PEC’s armored vehicle modeling capabilities, please contact Matt Barsotti, Dr. David Stevens, P.E., or, Dr. Eric Sammarco, P.E. 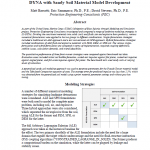 See the PEC Tech Note Comparison of Strategies for Landmine Modeling in LS-DYNA with Sandy Soil Material Model Development to read the full paper presented at the 14th International LS-DYNA Users Conference. See the PEC Tech Note Modeling of Landmine Loading of Armored Vehicles and Extension to Field Testing Assessment to read the full paper presented at the 2016 NDIA Ground Vehicles Systems Engineering and Technology Symposium (GVSETS).